240 pages | 44 B/W Illus. Why do people destroy objects and materials that are important to them? 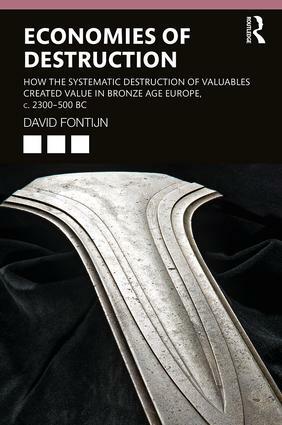 This book aims to make sense of this fascinating, yet puzzling social practice by focusing on a period in history in which such destructive behavior reached unseen heights and complexity: the Bronze Age and Early Iron Age in Europe (c. 2300-500 BC). This period is often seen as the time in which a ‘familiar’ Europe took shape due to the rise of a metal-based economy. But it was also during the Bronze Age that massive amounts of scarce and recyclable metal were deliberately buried in the landscape and never taken out again. This systematic deposition of metalwork sits uneasily with our prevailing perception of the Bronze Age as the first ‘rational-economic’ period in history – and therewith – of ourselves. Taking the patterned archaeological evidence of these seemingly un-economic metalwork depositions at face value, it is shown that the ‘un-economic’ giving-up of metal valuables was an integral part of what a Bronze Age ‘economy’ was about. Based on case studies from Bronze Age Europe, this book attempts to reconcile the seemingly conflicting political and cultural approaches that are currently used to understand this pivotal period in Europe’s deep history. It seems that to achieve something in society, something else must be given up. Using theories from economic anthropology, this book argues that –paradoxically – giving up that which was valuable created value. It will be invaluable to scholars and archaeologists interested in the Bronze Age, ancient economies, and a new angle on metalwork depositions. Chapter 2 Selective deposition – what does it entail and how can it be studied? Chapter 6 Gifts to familiar gods? Chapter 8 Economies of destruction: ‘keeping-while-destroying’? David Fontijn is professor in the archaeology of early Europe at the Faculty of Archaeology, University of Leiden and affiliated member of the German Archaeological Institute (DAI). His research focuses on ritual landscapes and on the social evolution of prehistoric farming societies in Europe and Eurasia. Previous books include the award-winning Sacrificial landscapes (2003) and Transformation through Destruction (2013; co-written/edited with S. Van der Vaart and R. Jansen).